An automated external defibrillator (AED) is a type of life saving equipment used to treat sudden cardiac arrest (SCA). It delivers a short, powerful electric shock to the heart, helping the heart to regain its natural rhythm. It is easy to operate, and emergency services will give step by step instructions over the phone if an emergency arises and there is no trained person available. Each year more than 1000 New Zealanders will suffer a heart attack outside of hospital. Many of these people have no prior symptoms and get no warning, and less than 5-8 per cent will survive if they don’t receive immediate treatment. Dialling 111 and performing CPR is not always enough to prevent death, however use of a defibrillator can increase the chance of survival by up to 40 per cent. An automated external defibrillator (AED) is designed to be easy to operate, with automated ‘talking’ instructions to help the user. They can be purchased through St John, who also supply the training. 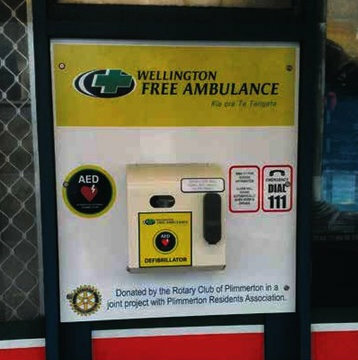 Plimmerton Residents’ Association chairman Colin Bleasdale said that the AED, valued at more than $2500, was a much needed resource. See the link below for a demonstration of how to use a defibrillator. Or a call to 111 in the event of an emergency will elicit simple instructions from the operator. Whilst the Rotary Club provide the equipment and the lock box, there is a requirement that the unit is owned by the community, as in Pauatahanui. There it is in a locked box (with a key pad) on the wall by the Lighthouse Theatre. If needed, the code can be obtained from emergency services. The Rotary Club of Plimmerton have provided several units, but other units are available at Whitireia, in the Porirua CBD, and in Judgeford, Pauatahanui and Titahi Bay golf clubs. Watch a demonstration – using a defibrilator.